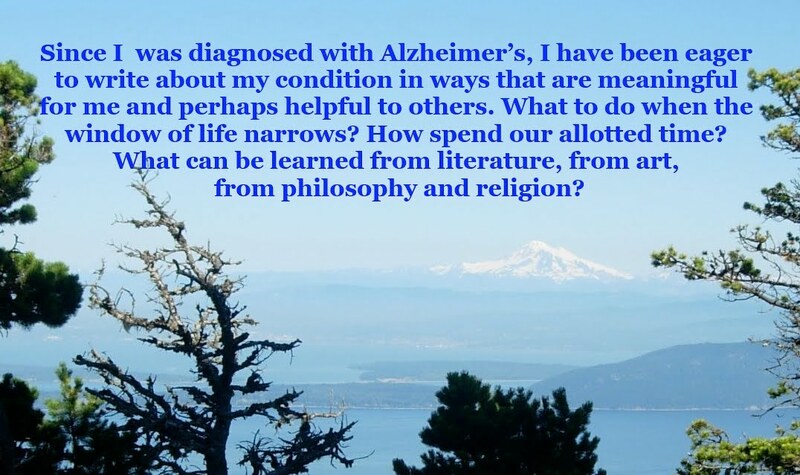 As I was writing this post, I was drawing on a slender document titled, “What If I Had Dementia?” Since I do have a form of dementia, this is not just a thought experiment. The organization’s website shows a soothing scene, with tendrils of low-lying land forms wreathed with mist against a deep-green forest and what looks like a Scandinavian fjord. The prose is intentionally bland. The document notes that years of life, post-diagnosis, varies widely, from up to an extreme of twenty years. The average time to reach the severe form of the disease is about eight years. But it’s worth mentioning that some individuals turn out to be outliers. Muhammad Ali, the most famous boxer of all time, surely is in this category. Ali was suffering from Parkinson’s disease, not Alzheimer’s, but he was clearly demented when he died at age 74. Barring a major research breakthrough in the near future, those of us with Alzhiemer’s now are very likely to die from the disease, unless some other disease or fatal accident puts an end to our lives. As the document notes, some patients lash out aggressively at loved ones, adding to the stress for caregivers and loved ones alike. And, of course, spouses or adult children often serve as caregivers, typically without compensation. The central question posed in the document is, “What kind of medical care would you want if you were to develop worsening dementia?” Under these circumstances, it’s important to be crystal clear about your intentions. As the document notes, those of us with Alzheimer’s or another form of dementia, should make clear, in writing, to make sure the person’s intent crystal clear. Paula and I are on the same page when it comes to the terminal stage of dementia. The last thing I would want to be is a burden on my family—neither physically, emotionally, and, especially, not financially. A couple of other comments: First, early-onset Alzheimer’s is not mentioned. This is no surprise. I’ve heard from people working in health care who are not aware that symptoms of Alzheimer’s can present themselves as early as one’s late forties. And these days, news articles about Alzheimer’s seem to be omnipresent, especially in the Boston area, home to many hospitals and research institutes and universities. But I found the survey is a little confusing, pertaining to having mild dementia. Who wouldn’t want to live through the early stage of the disease? That is the period when the disease is least worse. The reason people fear the middle stage is obvious: It is a downward promotion, and an implicit message: The next two stages will be worse. With this understanding, I named this blog, “The Diminishing Window.” Now is the time to make hay while the sun is still up. In 2015, I received a grant from the Somerville Arts Council. This was not the first time I’d received funding from the city. But the circumstances were much different. Back in 2008, my grant was the result of a slender satirical novel I self-published. When I applied for the money in 2015, I wasn’t sure whether my blog would even qualify as an “arts” entry. But it did. And Jane Callachan, then living in Somerville, reached out to me to ask if she could be on my panel. I agreed, and I wasn’t disappointed. The library where the forum took place was packed—a clear demonstration that people with dementia can be productive. And the forum sent a clear message: people with dementia are not just capable speaking publicly; they can organize such events. And by the time of the forum, Jane had a new diagnosis: posterior cortical atrophy, a variant of dementia that affects vision. Even back then, I was not comfortable speaking unless I had a text to read from. But Jane required no such help. She spoke fluidly and compellingly, without the help of notes. Her problems, when they came, were difficult to pinpoint. About a year earlier, she started making mistakes in her work. At that early stage, Jane had no trouble catching the miscues. But then it became difficult to do her job. Confiding to her sister, Annie, proffered advice: “Just calm down.” But Jane could sense that something was wrong. “I kept on saying, ‘there’s something wrong with me. I think I have early-onset Alzheimer’s.’” According to Jane, Annie still has a residue of guilt for not taking more seriously Jane’s concerns about having Alzheimer’s or some other form of dementia. Early on, Jane was terrified by the notion that she might be going blind. Another factor in her life was depression, which she had lived with since her teenage years, although she didn’t take drugs for the condition. A new concern for Jane, after her original diagnosis, was anxiety. “When you have to make a phone call, and when you can’t read the numbers on your phone, it is stressful. And when you start thinking you can’t do those things, you start thinking that you are losing your mind. I was terrified. It made me feel small, weak, afraid, terrified.” Jane slowly enunciated each word. At this point, Jane and Annie made a second trip to LensCrafters. But nothing changed for Jane. The next step—the crucial one—was to meet with a neurologist. Jane’s therapist provided common sense: “If you think you’re going blind or going crazy or have Alzheimer’s, see a neurologist.” And because the situation was deemed urgent, a PET scan was scheduled promptly, at Beth Israel Hospital in Boston. In the two-plus years since Jane and I received our initial diagnoses, we’ve both been active in advocating for the Alzheimer’s Association agenda—taking part in lobbying the Massachusetts State House as well in the nation’s capitol, and taking part in forums in cities like Brockton and Marlborough. Currently, Jane is volunteering at a Salem elementary school, where she and her husband now live. But she wants to increase her portfolio as an activist on behalf of dementia. Recently, Jane visited a Salem “Memory café”—a venue in which a range of people with cognitive problems can congregate comfortably, despite their limitations. These days, Jane is living in a townhouse in Salem, Massachusetts, with her husband, not far from her sister’s unit in the same development. She misses Somerville, but the two sisters just are perhaps closer—both literally and figuratively—than they have been since they were growing up. Jane and her husband are residing in the same townhouse development where Annie has been living for some time.